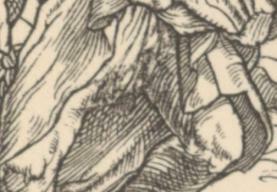 The dance starts with a copy of Mechel's frontispiece. The best of them are quite good. This series is of high quality, and I must admit that I for a long time perfunctorily assumed they were Holbein's originals with French subtitles instead of the German headings used for the so-called printers' proofs. 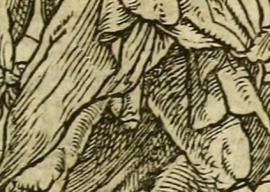 The best of them could easily be mistaken for genuine Holbein, and those that are less stellar could be taken for smudgy prints of the originals. But in fact we are dealing with copies of copies. They were employed in the margins of books published by Curmer in Paris in the 1850ies and 1860ies, and according to these books,(1) they are copies of Joseph Schlotthauer's lithographs. 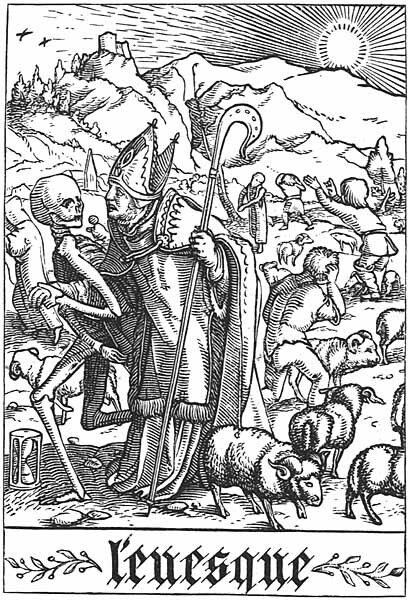 The series contains 53 scenes by Holbein, i.e. 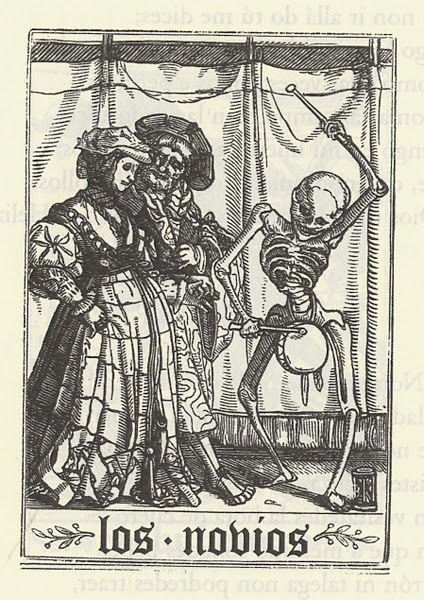 all those woodcuts that were in the 1547-edition of Imagines Mortis. 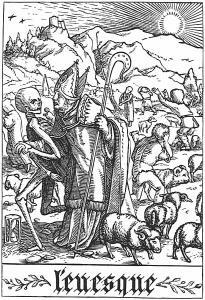 The series starts with a copy of Christian von Mechel's frontispiece, and ends with nine additional pictures, among others from Basel's dance of death. The subtitles are a story in themselves. One gets the impression that they are taken from the books by Hippolyte Fortoul that are illustrated by Schlotthauer, but none of the books I have seen by Fortoul have titles for the images. The titles are written in a style that's reminiscent of Simon Vostre's and a few of them seems to be inspired by Vostre. One example is the duchess, who for inscrutable reasons is called "la femme grosse" — the pregnant woman — just like Vostre's "la femme grosse". Or the noblewoman, who is called "l'amoureux" like Vostre's suitor. In the same manner Holbein's canon becomes an abbot, while his abbot becomes an archbishop. The painter's wife from Basel is called "la vielleuse", which is a bit odd, partly because she's not particularly old, and partly because we've already met the old woman / "la vielle" earlier in the dance. 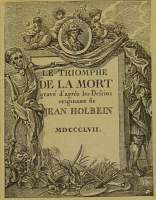 The black hornblower from Danse Macabre in Paris becomes "le roi more" — the moor king. He's not dressed very royally so one gets the impression that "le roi more" was inspired by the dead king in Paris, "le roy mort". 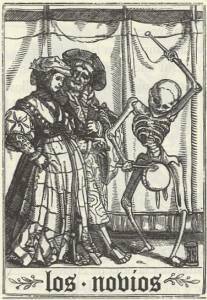 When it comes to the artists the information is a bit conflicting, but it seems Holbein's dance of death was copied by Judée, Anne, Bisson, Cottard, Dufresnoy and Dumont, while the rest of the scenes were copied by Bisson & Cottard. But no matter what the books say, it isn't true for The escutcheon of Death. 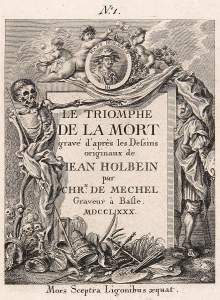 This hasn't been copied after Schlotthauer, but is the same that is included in the various books with Holbein's dance of death-alphabet, and in these books it is unequivocally stated the escutcheon has been copied by Léon le Maire. It is quite strange — especially because these books weren't published by Curmer, but Edwin Tross. Nevertheless anyone can check that Curmer's picture is identical with the one attributed to Léon le Maire published by Tross. Les évangiles des dimanches et fêtes de l'année (1864). At the end of the book are copies of Jost Amman's "Eygentliche Beschreibung aller Stände auff Erden". 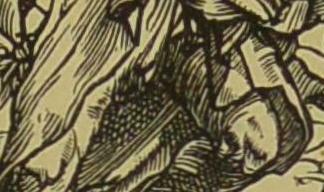 Then follows the woodcuts in question and finally copies of Simon Vostre's marginals. Appendice a L'imitation de Jésus-Christ (1858). At the end this appendix are the dance of death and a copy of Simon Vostre's marginals as well. 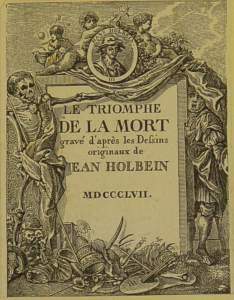 Curmer had copied the frontispiece from Christian de Mechel. Curmer also published copies of Simon Vostre's marginals. There are many allusions but the most concrete is: »Quant aux figures, j'ai donné la copie fidèle et complète de la belle Danse des Morts d'Holbeín, d'après les gravures de Hans Lutzenberger, reproduites avec un soin et une exactitude parfaite par M. J. Schlotthauer«. 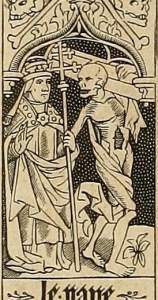 Quoted from Appendice à l'imitation de Jésus-Christ in the very last chapter about la danse macabre.